AWS S3 is a simple storage service offered by Amazon AWS that give you the ability to use it as a webservice. Imagine a Dropbox or Google Drive that allows you to upload or download files programmatically with an API. We will go through all the process of using a S3 with NodeJS, from creating the S3 Bucket and access credentials to actually use the bucket. 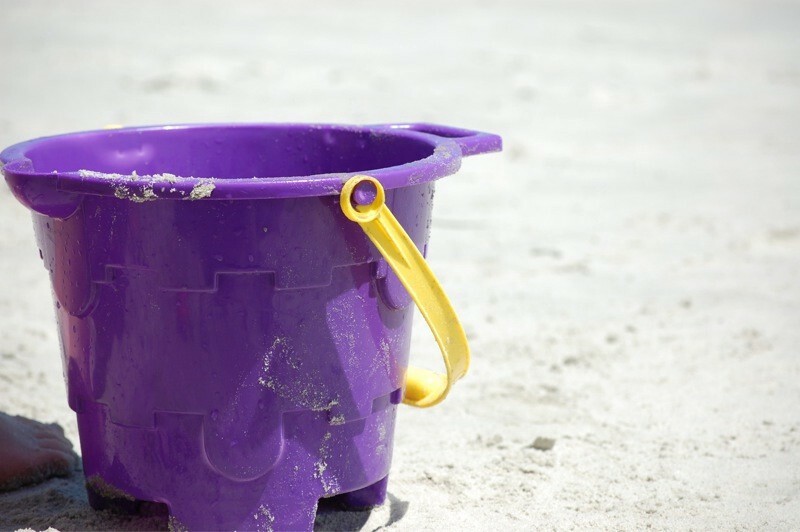 S3 Bucket: is a storage unit from the S3 service from Amazon. You can store different type of files (data) and have metadata that describes the actual data or file. 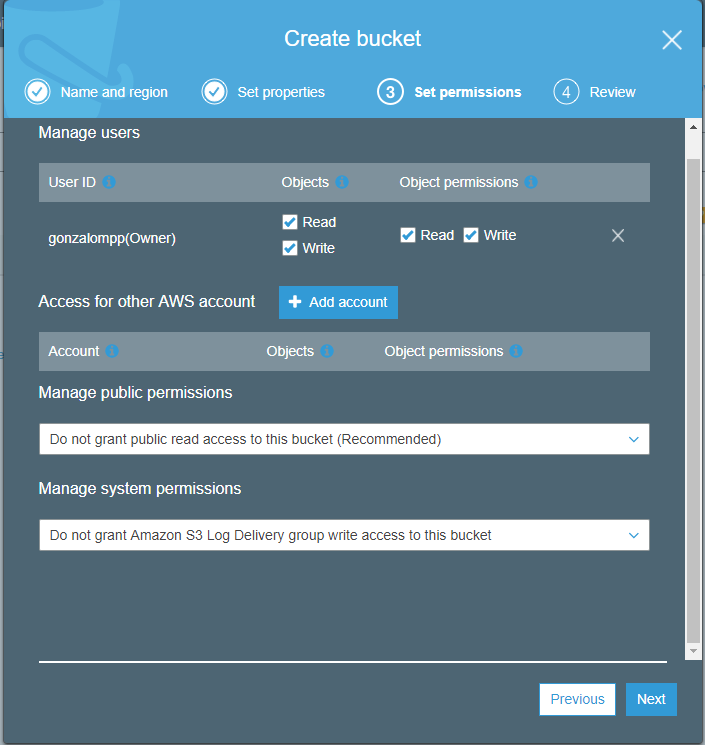 Access Key ID: Is the identification for a certain access key that allows an application or user to access a set of preconfigured AWS Resource (like a S3 Bucket for example). Now that we understand all of this concepts, we must configure the Amazon Console before start coding. The easy way to obtain a key pair is to create them for your default account for AWS Console. Then, click in “My security credentials” and “Access keys”, finally, click “Create New Access Key”. Copy and store them in a secure place. We will use them later. Go to “Services/Storage/S3” and then click in “Create Bucket”. Click next, next, next and you will have the bucket created. The way that we will need to identificate the bucket is with the “Bucket name” (in this case is “creative-bucket-name-6355123”). So keep it in mind for later use. Before you start coding, let’s create the basic project. Create a blank project using the command and typing the information required (project name, repo, licence, etc). Now, go to the root folder and write the following command to install the AWS Package of NPM inside the project. Replace in Line 7, “<Access Key Here>” with the Access Key ID from the step 1. Replace in Line 8, “<Secret Access Key Here>” with the Secret Access Keyfrom the step 1. 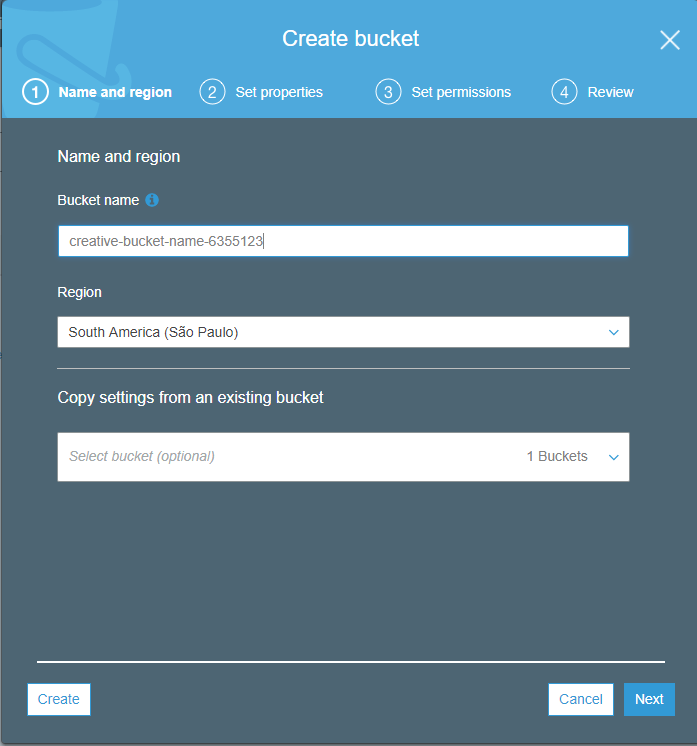 Replace in Line 16, “<Bucket Name here>” with your Bucket name created in the step 2. All set, if you run “npm start” you should see a console message indicating the URL of the file uploaded. Go to your AWS console and check if your file is up. Line 21: Uploading file and response callback (second parameter with the function). That’s it! you can leave questions or doubts that you could have in the comments area bellow and I will complement the post.